Earlier this month, Fred Swan wrote a great piece about the tasting, explaining that Jon and Eric talked at length about the history of the California wine industry – walking us through where California’s been, where it is, and where they think it’s going. Bonné has been writing quite a bit about California’s diverse history for the past several weeks, so I figured I’d share some of Eric Asimov’s commentary from the tasting. 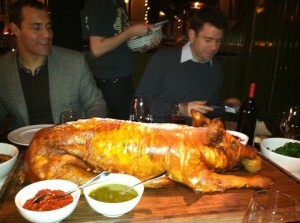 Feldsen and White, about to eat a pig. 1982 was arguably the greatest vintage in Bordeaux since 1961. 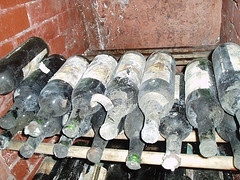 To some, it is the seminal Bordeaux vintage of the twentieth century. It was also the vintage that made the young lawyer from Baltimore, Robert Parker, a household name in the wine world. Contrary to his peers at the time, Parker called the ’82 vintage superb and urged his nascent Wine Advocate subscribers to buy up all the wine they could. It was the call that made a career. 1982 was also the year in which I was born, so to celebrate my birthday a few weeks ago, several friends and I decided to drink our way through 1982 in New York City. 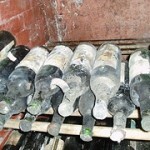 Unfortunately, prices for 1982 Bordeaux have hit astronomical levels. Since none of us was willing to drink the monetary equivalent of a small car — five bottles of 1982 Lafite would have run us nearly $20,000 — we had to be more creative. And so we turned to Napa and a seemingly unheralded and under the radar class of 1982 Napa Cabernet. There is something exhilarating about drinking something that is as old as you. The aging process can be unpredictable and unforgiving and it’s interesting to take stock of how things — people and wine — have evolved at certain points in their lives. As I’ve become increasingly interested in wine, I’ve been bitten by the “birth year wine” bug. Because my non-wino parents didn’t have the foresight to predict my fascination with wine, I’m not one of the lucky few who inherited a stash of 1983 Lafite. So, in anticipation of my birthday, I did some research to determine which region of the world to turn to for a bottle of 1983 juice. I eventually settled on Bordeaux, as my experience with aged wine is limited and I wanted something reliable. The product of a good but not great vintage in Bordeaux, I figured a bottle of 1983 Chateau Clinet would be solid, if not spectacular while not breaking the bank. I was right. Upon opening, I was surprised to find quite a bit of alcohol on the nose, somewhat masking the undercurrent of classic aged Bordeaux. In the mouth, the wine was dominated by burnt toast and smoked meat. It was much more primal and tannic than anticipated, especially given the notes on Cellar Tracker indicating the wine would be over the hill. Far from it, in my opinion. Fast forward 30 minutes, and bright red fruits are prevalent, with an enjoyable earthy finish that lasts 30+ seconds. At this point I’m lamenting the fact that I didn’t decant more of this as I’d already poured tastes for my family. Ninety minutes in and the tart fruit is still present but the secondary characteristics of rocks and clay are really emerging as the dominant trait. This is clearly a mature wine, with earthy notes and toasted caramel overshadowing the fruit. I’d have liked to follow this bottle a bit further but my family drank it down. While I wasn’t blown away by the bottle, and I wouldn’t buy another at the price I paid, it was fun addition to a fantastic birthday dinner. Next year I’ll get more adventurous with my selection! Any suggestions? No Old Wine For You! There are a lot of cute sayings that lead one to believe time is kind to many a material item. While wine with some age on it can be an eye-opening experience, it can also be an extreme letdown. In order to broaden my palate and hopefully discover some bottles that fit in to the former category, this past summer I resolved to try some aged Bordeaux. The first stone I overturned was the aged Bordeaux list on the website of my favorite Washington, DC retailer, Schneider’s. Among the three figure and up offerings of various first and second growths, I stumbled across a name I recognized and a price I couldn’t believe. It was a half-bottle of 1952 Chateau Gruaud Larose for $40! I quickly got in touch with David White as he knows far more about Bordeaux than me. David confirmed that this was a very intriguing offering, and at the very least a gamble worth taking. Gruaud Larose is an estate situated in the southern-most part of the left-bank St. Julien appellation, which is sandwiched between Pauillac to the north and Margaux to the south. While St. Julien estates were shut out of the first-growth classification of 1855, the region boasts an impressive five second growths, including Gruaud Larose. After a quick call to Schneider’s to check on the condition of the bottles (they had four, I believe), we arranged to purchase the bottle that was in the best shape. We picked up the bottle and let it “relax” for a couple days before pulling the cork on a Saturday afternoon at David’s. The cork came out relatively easy. The color was a gorgeous light brown, and the wine offered initial hints of fruit that faded to a wonderful aroma of prunes and sweet toffee. We both remarked that, once the fruit faded, the nose could be mistaken for that of a tawny port. In the mouth, the wine was filled with smokiness and toast. 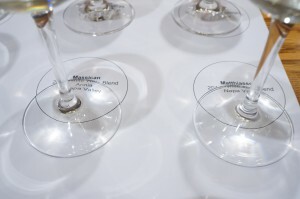 Incredibly, there were tannins still present, as well as wonderfully complementary acidity. The finish was at least a minute long, giving up hints of the caramel and toffee present in the nose. This was one of the most enjoyable glasses of wine I’ve ever had. It wasn’t the best wine, it wasn’t the best setting, and it certainly wasn’t the best company (kidding, David), but it was probably my most memorable experience drinking wine. I was entranced by the idea that this wine was in a bottle longer than my parents have been alive. This wine was a relic, as evidenced by what we read as we perused the label. We noticed that the wine was actually bottled in London as opposed to at the estate, which David informed me was a common practice at that time. 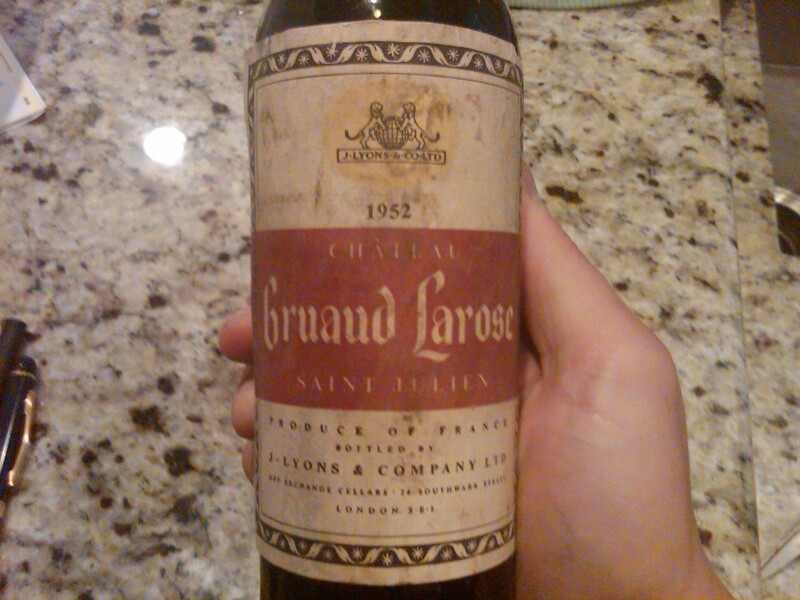 While we didn’t purchase the remaining bottles at Schneider’s as we both had our limited budgets allocated to other finds, I will certainly seek out similar bargains in the future in the hopes that I have an experience that comes close to the ’52 Gruaud Larose. I’d love to hear about your most memorable wine-drinking experience in the comments section!